Roy’s badass crew of birds doesn’t even attack the gulls. 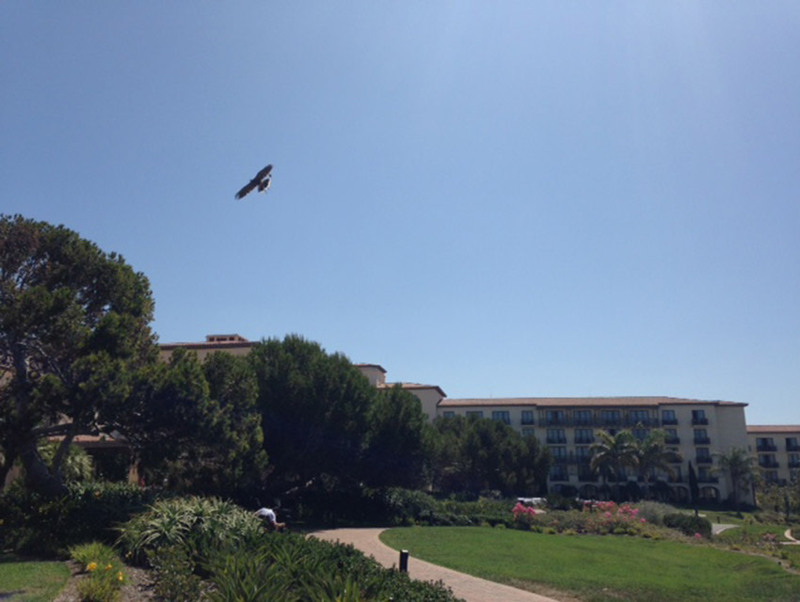 All they have to do is fly around the grounds a few times a day and pesky birds like gulls, grackles, pigeons, ravens, and crows get the message and clear out. 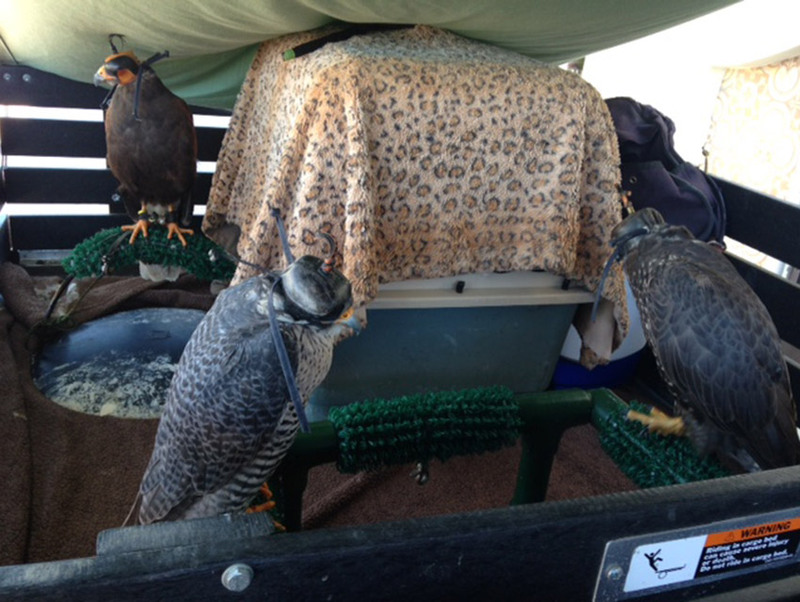 “I call them bouncers,” Roy says of his falcons before we zip towards the meadow to take Teo, his Harris Hawk for a fly. Teo takes off from Roy’s gloved arm and glides to a balcony with the tinkle of a bell (each bird has its own bell with a unique tone). The hawk is also fixed with a radio transmitter so Roy can find him if he flies a little farther out. That doesn’t happen this time. Roy does a quick whistle, and the raptor returns to his hand. He then gives him something to eat. I soon realize that the birds provide two services. 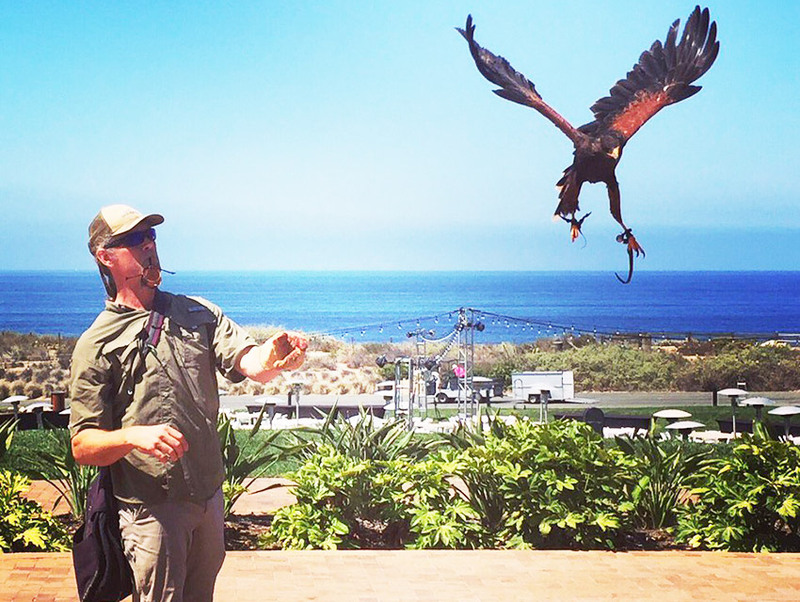 Their primary function is to keep the gulls away, but they also fascinate guests, who stop eating or hiking and to chat with Roy who introduces himself as “Bird Control.” They take pictures with Teo. 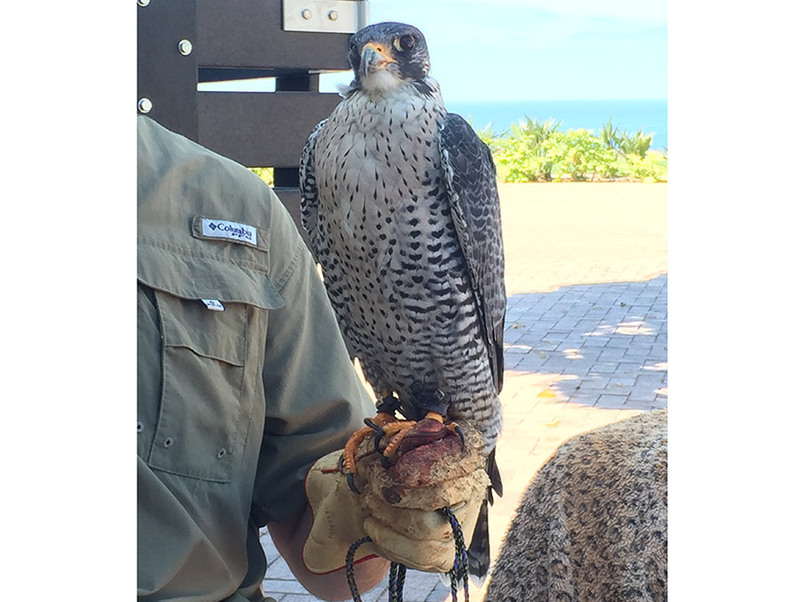 Roy also takes Omen, a gyrfalcon—the largest of the falcon species—out of the cart for a proper introduction. Roy has raised and trained him since the bird was an 18 days old. Normally Omen, who has a squinty right eye (making him even tougher looking), flies undisturbed for a few hours each day, eventually landing back on Roy’s cart when he is hungry. But because a pair of peregrine falcons have nested on the property, Omen is grounded until the birds move on—he can get a little National Geographic when it comes to other birds. 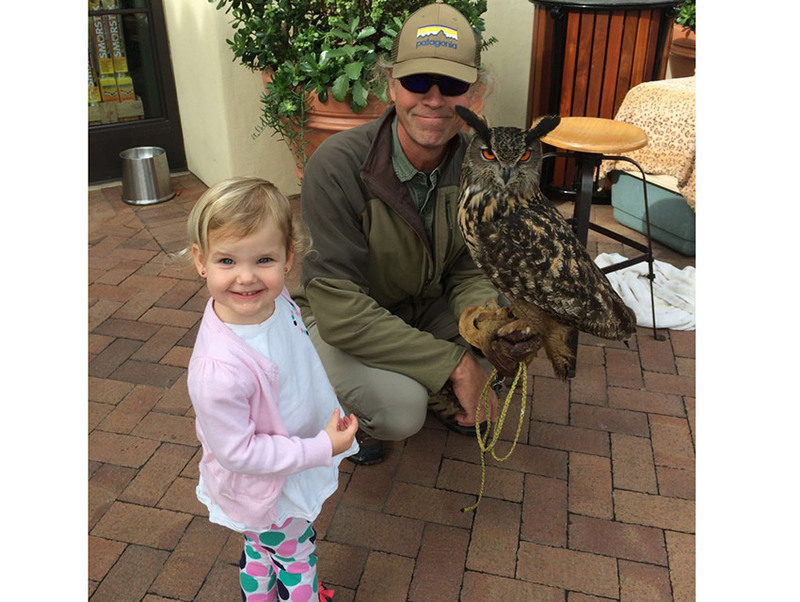 Roy’s birds rarely harm the wildlife, and local fauna is one of the resort’s many draws; at night there are enough bunnies for a Disney movie. Roy can rattle off the location of every nest on the property and what kind of creatures live there. Teo takes off again and buzzes my head. I try not to flinch. (He’s been doing that a lot. I am definitely the Kevin Hart to his Ice Cube). A mockingbird, one-fourth of Teo’s size, darts out of a tree and starts squawking and circling the hawk. Teo simply ignores it and keeps flying. The petite mockingbird charges at him a few more times before flying off. Apparently mockingbirds are the gangsters of the bird world. Teo doesn’t have a honed hunting instinct, so the mockingbird is lucky. The squirrels and rabbits that freeze when Teo glides overhead needn’t bother. As I drive out of the resort, I spy Roy and Owlbert surrounded by people, half of them kids, underneath a tree near the entrance. At about 1 p.m. he and his bird crew will head home. They’ll be back again tomorrow to start the day before the sun comes up.